If you're thinking about installing a lawn irrigation system this year, I can provide you with a complete installation. I use Rainbird systems and install them using rigid PVC pipe with flexible tubing at the spray heads. I design the system to provide even coverage throughout the lawn. There are cheaper ways to install irrigation systems, and I repair those systems quite often. But for new installations, going the extra mile on the installation, will definitely pay off in the long run. For landscape beds I use a special micro irrigation setup that puts the valuable water exactly where it needs to be and doesn't waste it by spraying the foliage. 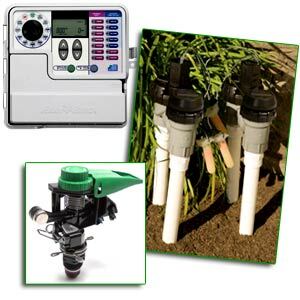 Irrigation systems save you time, and money. All plants require water on a regular basis. Making sure your expensive plantings get that water consistently not only improves the health and look of your landscape, but a properly installed and maintained automatic irrigation system conserves water. Did you know that a clogged head or a torn line can wreak havoc on your landscape and water bill? Systems need periodic preventative maintenance to insure they are operating under optimum conditions. Call me today and request your FREE lawn irrigation estimate.